Ms. Kristine Landon- Smith and Mr. Felix Cross from Britain began Workshops with Akshar students, June 18, 2018 which concluded on June 28, 2018. Ms.Landon-Smith worked on skill development activities like attention, concentration and observation through games. Kristine Landon-Smith has been a Director, and Co-founder, of Tamasha Theatre Company, Britain's leading Asian theatre company,” whose vivid and distinctive performance style has been applauded by critics and audiences alike”. 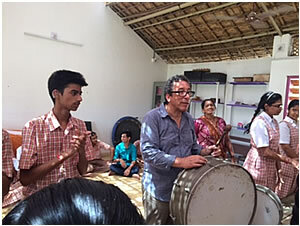 Mr.Cross worked on ‘Listening Skills’ through music & rhythm at Akshar. Felix Cross was the artistic director of the theatre company, Nitro, in the U.K for almost 20 years. He got an MBE in 2012 for services to musical theatre. The endeavour of Akshar Trust is to enable the individual with hearing impairment to have a useful, happy and fulfilling life. Children with hearing impairment deserve a sound academic environment which will prove to be their opportunity, perhaps their only opportunity, for a life of self-reliance and dignity. 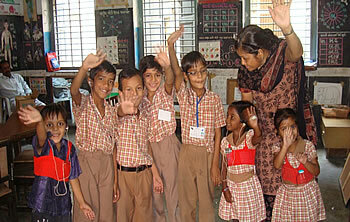 Provide education and care to hearing impaired children and guidance to their families. 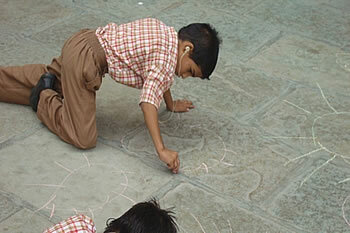 Conduct research, investigation and experiments in education of hearing impaired children. Train teachers of the hearing impaired. Statistics in the field of disability in India have always been problematic. 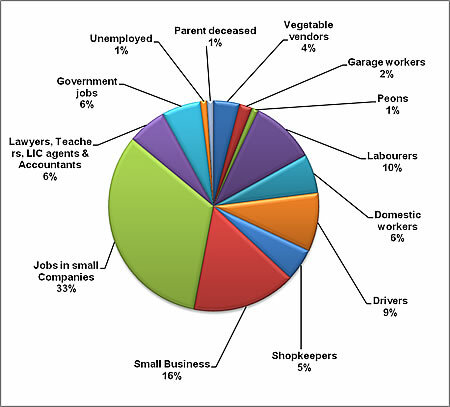 The percentage varies from 2.21% of the census of 2011 to 10% of UN estimates. Some estimates refer to nearly 4 crore people with disability in India. 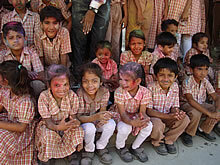 26,500 hearing impaired children are born every year in India. Less than 35% are enrolled in schools. The question pertaining to Disability was pushed up from Question 15 to Question 9 in the census of 2011 but further training of enumerators is necessary for authentic information. 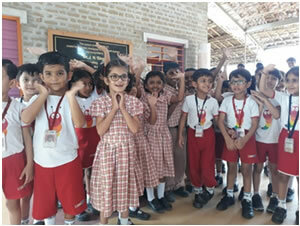 Experience of the past 28 years has shown Akshar that given the correct pedagogy, technology and opportunity, a child with deafness can and does perform as well as the next child without deafness. This is the belief that drives our work. The inauguration ceremony for the new school campus is scheduled for Friday, April 29th, 2016 by the Chief Guest Dr. J. N. Singh, Additional Chief Secretary, Finance Department, Government of Gujarat. અક્ષરઅક્ષર ટ્રસ્ટ ૨૮ વર્ષથી શ્રવણમંદ બાળકોના શૈક્ષણિક ક્ષેત્રમાં કાર્યરત એવી બિન નફાકારક, સ્વૈચ્છિક અને ધર્મ નિરપેક્ષ સંસ્થા છે. અક્ષર ટ્રસ્ટની સ્થાપના ૧૯૮૮માં ૫ બાળકો સાથે થઇ હતી. આજે સંસ્થામાં ૧૩૦ શ્રવણમંદ બાળકો અભ્યાસ કરે છે. અત્યાર સુધીમાં 100 વિદ્યાર્થીઓએ ધોરણ ૧૦ અને ધોરણ ૧૨નો અભ્યાસ પૂર્ણ કરેલ છે. કેટલાક વિદ્યાર્થીઓએ M.S. University, Gujarat University અને S.P. University માંથી કોમર્સ, આર્ટસ અને ફેમીલી સ્ટડીઝમાં સ્નાતક થયેલ છે. આ ઉપરાંત 3 વિદ્યાર્થીઓએ M.Com કરેલ છે. હાલમાં ૧ વિદ્યાર્થી M.S. University માં બેચલર ઓફ આર્કિટેકચરમાં અભ્યાસ કરે છે. શાળાના ભૂતપૂર્વ વિદ્યાર્થીઓમાંથી ૨ વિદ્યાર્થીઓ બેંકમાં અને 4 વિદ્યાર્થીઓ Paul Mason Consulting માં કાર્યરત છે. વર્તમાનમાં શાળાનું પોતાનું બિલ્ડીંગ તૈયાર થઇ ગયું છે. આ બિલ્ડીંગ એક આગવું ‘ગ્રીન બિલ્ડીંગ’ છે. જેનું ઉદઘાટન ૨૯ ફેબ્રુઅરી ૨૦૧૬ના રોજ ડૉ. જે. એન. સિંગ, એડીશનલ ચીફ સેક્રેટરી, ફાઈનાન્સ ડીપાર્ટમેન્ટ, ગુજરાત સરકારના હસ્તે કરવામાં આવ્યું. કોઈ પણ શ્રવણમંદ બાળકને શાળામાં પ્રવેશથી વંચિત રહેતું નથી. દરેક સામાજિક અને આર્થિક પરિસ્થિતિવાળા વિદ્યાર્થીઓ પ્રવેશ મેળવી શકે છે. બધિરતાની સાથે સાથે બીજી વધારાની વિકલાંગતા ધરાવતા બાળકોને પણ પ્રવેશ મળે છે. મોટી ઉમરના બાળકોને પણ પ્રવેશ મળે છે. આખા વર્ષ દરમિયાન પ્રવેશ મળે છે. શ્રવણયંત્રો નિ: શુલ્ક આપવામાં આવે છે. ગુજરાતી અને હિન્દી બંને માધ્યમમાં શિક્ષણ આપવામાં આવે છે. ૮૦% વિદ્યાર્થીઓ પાસે પ્રોગ્રામેબલ શ્રવણ યંત્રો છે. તેની કાળજી રાખવા માટે ચેક લીસ્ટ રાખવામાં આવે છે. સોફ્ટવેર અને અન્ય ઉપકરણ(સ્પીચ ટ્રેનર)ના માધ્યમથી વાણી પ્રશિક્ષણ આપવામાં આવે છે. વર્ગોમાં લુપ ઇન્ડકશન સીસ્ટમ લગાવેલ છે. અક્ષર ટ્રસ્ટની મુખ્ય ૩ ધારાઓ છે. ગુજરાતમાં નાની વયના શ્રવણમંદ બાળકો માટેનો અર્લી ઇન્ટરવેન્શન પ્રોગ્રામ સર્વ પ્રથમ અક્ષર ટ્રસ્ટ દ્વારા શરુ કરવામાં આવ્યો હતો. અહી વિવિધ ગતિવિધિયો દ્વારા જન્મ થી 3 વર્ષની વયના શ્રવણમંદ બાળકોના સર્વાંગીણ વિકાસ માટે કાર્ય કરવામાં આવે છે. નાની વયે જ શ્રવણમંદ બાળકનો વિકાસ કરવા માટે તેમના અભિભાવકને યોગ્ય માર્ગદર્શન અને પ્રશિક્ષણ પ્રદાન કરવામાં આવે છે. સ્પેશિયલ સ્કૂલમાં પ્રી સ્કૂલ થી ધોરણ ૧૨ સુધીના ગુજરાતી અને હિન્દી માધ્યમના નિયમિત વર્ગો ચલાવાય છે. અહી વિશેષ પ્રશિક્ષિત શિક્ષકો દ્વારા ગુજરાત બોર્ડના અભ્યાસક્રમમાં આવશ્યકતાનુસાર અનુકુલન કરી શિક્ષણ પ્રદાન કરવામાં આવે છે. અહી શ્રવણમંદ બાળકોને એવી રીતે તૈયાર કરે છે કે બાળકો મોટા થયા પછી પુખ્ત ઉમરે સમાજમાં અન્ય લોકો સાથે પ્રત્યાયન કરી શકે અને સારી રીતે પોતાનું જીવન યાપન કરી શકે. આ માટે શાળામાં વાણી, વાણી વાંચન, અને લેખન ઉપર ભાર મુકવામાં આવે છે. બાળક પોતાની બચેલી શ્રવણ ક્ષમતાનો ઉપયોગ કરી શકે તે માટે તેણે શ્રવણ યંત્રના ઉપયોગ દ્વારા સાંભળવાની તાલીમ આપવામાં આવે છે. અત્યાર સુધી ૫૫ શ્રવણમંદ બાળકોને સામાન્ય શાળામાં સંકલિત કરાયા છે. અક્ષર ટ્રસ્ટ ખાતે ૧૯૯૯થી શ્રવણમંદ બાળકોના શિક્ષકો તૈયાર કરવા માટે ભારતીય પુનર્વાસ પરિષદ, ભારત સરકાર દ્વારા માન્ય વિવિધ પ્રશિક્ષણ કાર્યક્રમ ચલાવવામાં આવે છે. જેમકે ડીપ્લોમા ઇન સ્પેશિયલ એજ્યુકેશન (હિયરીંગ ઇમ્પેરમેન્ટ), બી. એડ. ઇન સ્પેશિયલ એજ્યુકેશન (હિયરીંગ ઇમ્પેરમેન્ટ) (બાબા સાહેબ આંબેડકર ઓપન યુનિવર્સીટી, અમદાવાદ). આ પ્રશિક્ષણ કાર્યક્રમો અંતર્ગત અત્યાર સુધીમાં ગુજરાત, રાજસ્થાન, મધ્યપ્રદેશ, ઉત્તર પ્રદેશ અને પંજાબ એમ વિવિધ રાજ્યોમાંથી ૨૫૦ વિશેષ શિક્ષકોને પ્રશિક્ષિત કરવામાં આવ્યા છે. જેઓ હાલમાં સમાજમાં પોતાની સેવા આપી ગૌરવપૂર્ણ જીવન જીવી રહ્યા છે. 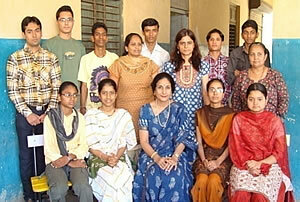 Akshar Trust, Vadodara, Gujarat, has been working as a charitable trust for hearing impaired children for 28 years. 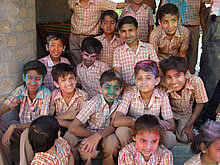 Akshar began in 1988 with 5 children and at the moment there are 135 students. In March 2016, 12 students are appearing for Std. 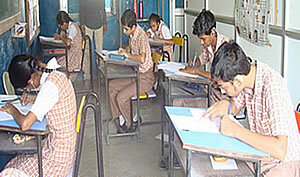 X & or XII of the Gujarat State Education Board (GSEB) which brings to 102 the number of students who have completed Std. X & or XII. 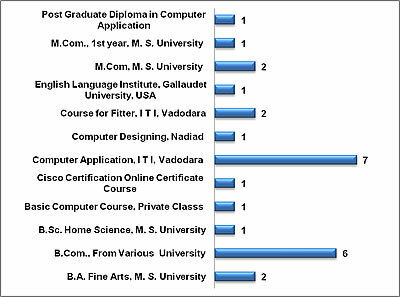 Many students have graduated from M. S. University, Gujarat University and Sardar Patel University in areas of Commerce, Arts and Family Studies. 4 have completed M.Com. Some students have joined ITI courses and many are gainfully employed with 3 pursuing further studies along with their jobs. 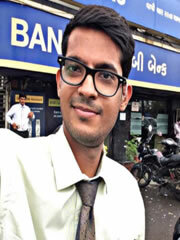 Dhara Panchamiya, a M.Com graduate and Shrenik Shah, a B.Com graduate have been employed by DCB Bank as Clearing Executives. 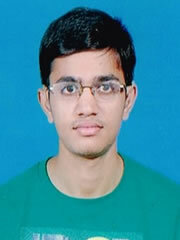 Ruchit Shitole is working in Paul Mason Consulting, Software Company, as a Test Analyst and Pratik Shah, latest and 4th entrant at Paul Mason Consulting, is a Test Trainee. Manushi Gandhi, having worked as an intern at architects, Karan Grover & Associates, has got admission into M. S. University for Bachelor of Architecture. Manisha Sindkar got 53 % in M.Com and was working with ONGC as an Accountant while Kanaka Bhatt finished her M.Com with 58 % and worked with an export house. Presently she is married and has 2 children. The school is recognized by the State Government. The Rehabilitation Council of India has given ‘Permanent Recognition’ to the Teacher Training conducted by us and recently Akshar Trust was given Accredited Status by the Rehabilitation Council for ‘Very Good Performance’ in 2009. Akshar Trust has also received an ‘Award for Excellence 2011 for Social Welfare by Individual, NGO or Institution’ from the Federation of Gujarat Industries on September 10, 2012. Akshar Trust has also been provisionally empanelled with the National CSR Hub of the Tata Institute of Social Sciences. 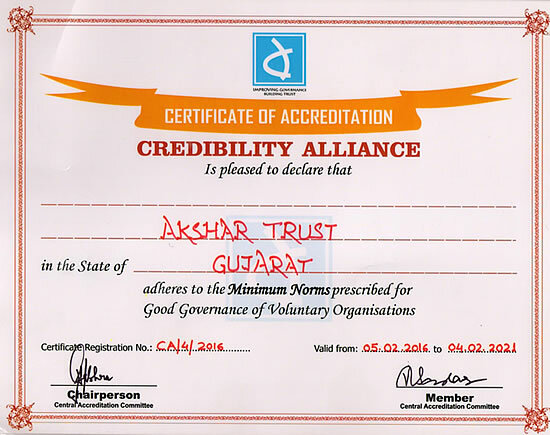 Akshar Trust has been accredited by Credibility Alliance in February, 2016. Akshar Trust has just been given the True Impact Awards of Jury Recognition, 2016 in the NGO Category by the District CSR Cell of Vadodara under the Chairperson of Mrs. Avantika Singh, IAS, District Collector, Vadodara. Oil & Natural Gas Corporation Ltd. (ONGC), Vadodara has donated a 39 seater school bus on ONGC Day August 14, 2014. 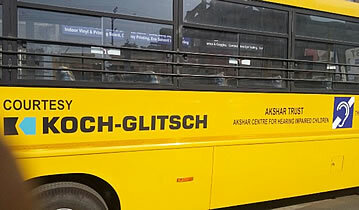 Koch-Glitsch, Vadodara has donated one 50+1-seater bus on January, 2016. State Bank of India has donated one 40+1-seater bus on March, 2016. Through donations, 146 students have been fitted with effective hearing aids. Software for Speech is also available. 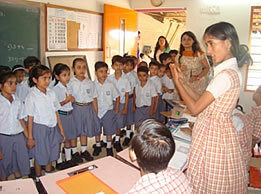 Akshar Centre is the only school for the hearing impaired in Gujarat which is Adapting Textbooks. 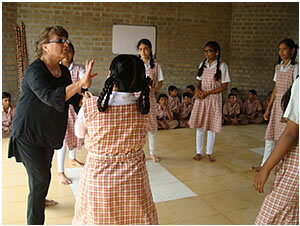 There is no other school for the hearing impaired in Gujarat which offers Hindi. The Early Intervention programme is the oldest in Gujarat and through the Mainstreaming programme nearly 57 children have been integrated. An Early Intervention and Detec tion Project (2013-14) funded by United Way of Baroda started on February 17, 2014. This has been initiated to interact with hospitals and ensure that children are identified earlier. For 20 years a bus has been running at a 75% subsidized cost. A hot mid-day meal started 21 years ago. 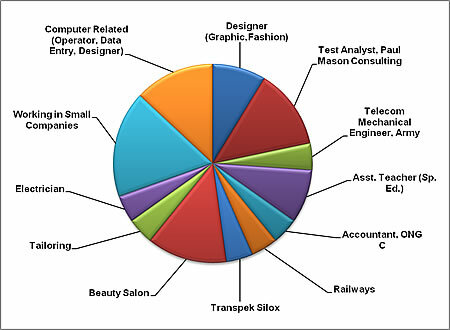 Students come from all socio-economic backgrounds. Children with problems additional to deafness are also admitted. 100% of the students are subsidized. Not even one student pays the required fees. Older deaf children are admitted. Admissions are open through the year. 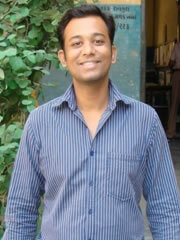 Akshar is the only 1 of 2 Centers, for the deaf in Gujarat, which is preparing students for Std. 12 Gujarat State board exams. Till date 49 deaf students have completed Std. 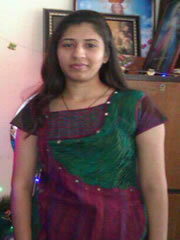 X & 21 have completed XII Gujarat State board exams. Curriculum Planning - week - wise before academic year begins. Material Development - art teacher illustrates. Report Card Day - Twice a year - individual meetings - all related teachers with parents. Lectures held for in-service teachers. 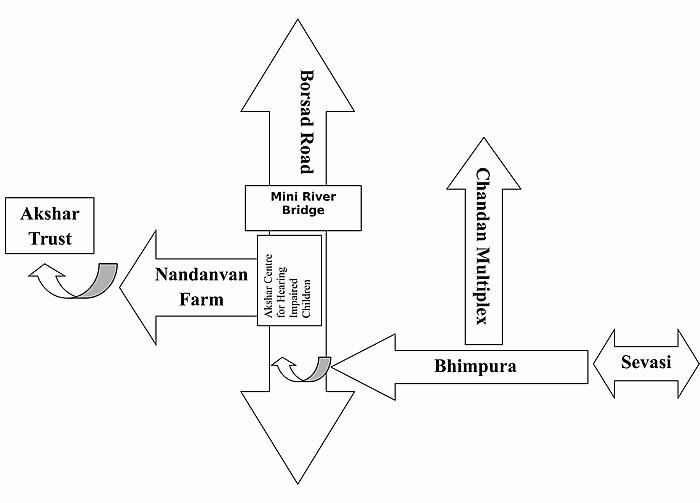 The District Administration has given Akshar Trust a 10,000 sq mt plot at Sherkhi village. 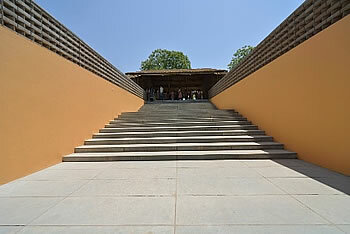 The new building is a unique ‘Green’ building, designed in an honorary capacity by Karan Grover & Associates, Vadodara. 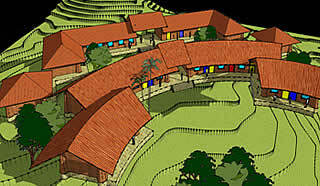 It has used mud-compacted bricks which were made at site and has a thatch roof. One of the Trust's long-range plans is to extend our work to rural areas where the need is even more acute. This would include identification of hearing impairment, fitting of low-cost hearing aids, and the training of mothers with hearing impaired children. 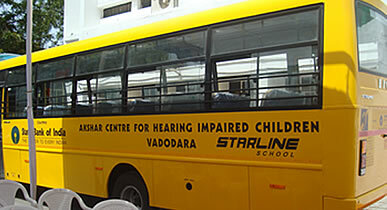 Gujarat State Fertilizer & Chemicals Ltd. has extended financial support for providing transportation facility from Vadodara to Sherkhi to 50 hearing impaired students for 10 months. 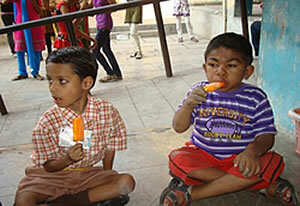 Akshar Trust is a non-profit, voluntary and secular organization. Registered as a charitable Trust under the Bombay Public Trust Act 1950 Under Sub-Section, No. E/4063/Vadodara dated 29-03-1989. Registered U/S 52 of the Persons with Disabilities Act 1995 with Gujarat Government, Director of Social Defence. All donations are 50% exempted U/S 80G (V) of the Income Tax Act 1961 vide order No. BRD/I.T – III/Tech/104/18/A dated 21-11-2007 permanently. FCRA No. 041960087 dated 06-06-2003 (For Foreign Contribution). Registered U/S 12 (A) (a) of the Income Tax act 1961, Dated: 13/04/1989. No. BRD/SIB/110-8-A/88-89. Akshar Trust has just been given the True Impact Awards of Jury Recognition, 2016 in the NGO Category by the District CSR Cell of Vadodara under the Chairperson of Mrs. Avantika Singh, IAS, District Collector, Vadodara. નોધ: પ્રવેશ પત્ર સંપૂર્ણ ભર્યા પછી સ્પીડ પોસ્ટ / કુરિયર થી માત્ર ઓફીસના સરનામે મોકલવું. Well wishers of the centre regularly donate snacks, stationery and furniture for the children. 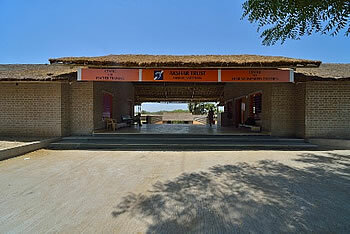 With prior appointment, you are most welcome to visit our Centre. 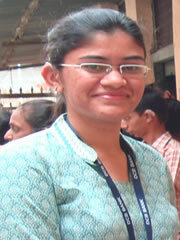 Manushi Gandhi has worked as an intern at architects, Karan Grover & Associates. 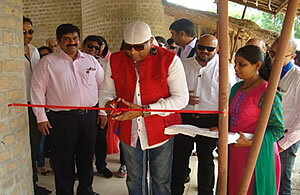 Baroda Round Table-49 has donated for the construction of 03 classrooms. These were inaugurated by Mr. Anandan Sivamani on September 29, 2015. 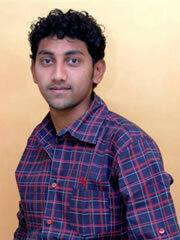 Shivamani is the famous percussionist. 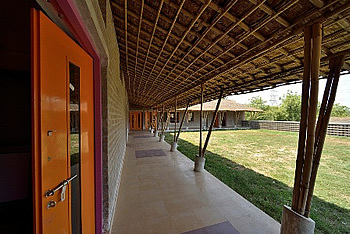 The 3 classrooms are in the new building constructed for Akshar Centre for Hearing Impaired Children at Sherkhi. Shivamani played drums & enthralled the audience which comprised of Baroda Round Table-49, Baroda Ladies Circle-76, Trustees of Akshar and the students. 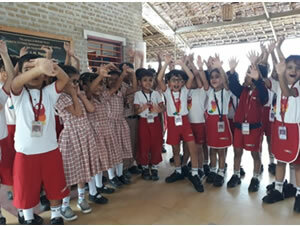 Akshar has started a ‘Capacity Building Programme’ for other Special Schools for the Deaf in Gujarat. 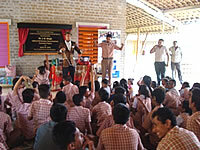 The first such programme has been initiated with Dhwani School in Bharuch. This will be on-going for a year. Rashtriya Madhyamik Shikshan Abhiyan, Gandhinagar invited Ms. Nisha Grover, Hony. Founder Director of Akshar Trust to be part of a broadcast on the channel, Vande Gujarat, on Awareness of Regular Teachers for Teaching Children with Disability. This broadcast was available at all Government Regular Schools in Gujarat, March 9, 2017. On Sept 21, 2016, ICICI Bank’s Regional Branch office organized ‘ICICI Bank Creative Masters Drawing Contest’, for students. Paintings of 15 students were selected. 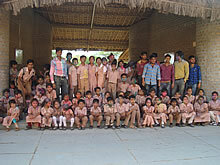 150 students of St. Kabir School of Std. 1 with 7 teachers visited, July 4, 2016. Mr. Pranav Pandya, Ocean Computers, Vadodara went to Paul Mason Consulting for discussing the upgrading of computers at Akshar on July 7, 2016. 15 staff members of Paul Mason Consulting, Vadodara, visited. 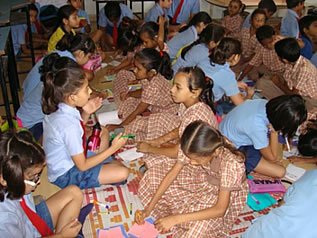 They engaged the children in a wide range of activities in 3 groups. They given muffins, soft drinks and stationery to the students, pens to the staff, August 5, 2016. 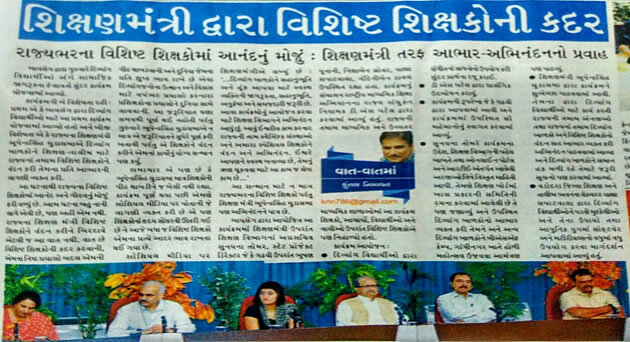 On August 24 & 26, 2016, 203 students and 9 teachers of Navrachna School, Vadodara came to interact with Akshar. 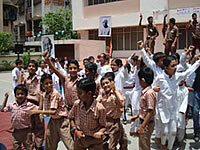 Students of both schools played games and did activities. 33 students applied for the Scholarship given by the Government of Gujarat for Children with Disability, August 24, 2016. 47 Students of Sr. K.G class of Vibgyor Kids School visited Akshar Centre on July 03, 2018 with four teachers. United Way of Baroda, Vadodara organized ‘Rangmanch’ a Platform for CWD. 16 Akshar students displayed Karate Skills at Gandhinagar Gruh, Vadodara, December 8, 2016. To celebrate the 120th Birth Anniversary of Netaji Subhas Chandra Bose Humanity First and Sevatirth Trust, organized a Fancy Dress Contest on January 22, 2017. 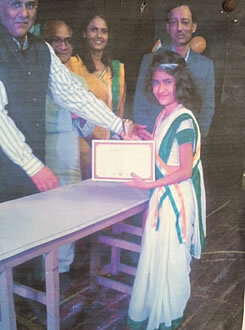 Liza Moin was awarded the 2nd prize for being Indira Gandhi. 20 students performed a Pyramid. All received certificates & snacks. Organized show at Akshar for students. 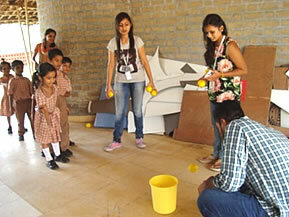 Various games & competitions were held for CWD. 1 student got a first prize of Rs. 800/- in Carrom. All participants got certificates. Students of St. Kabir sang patriotic songs. Akshar students danced. Lunch was provided & each student given a ‘Thank You’ card. Ms. Nisha Grover was invited as a Guest for the celebration. 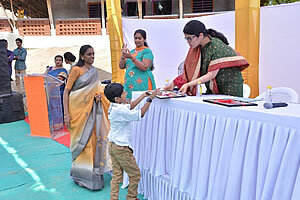 Akshar celebrated its 21st Sports Day at E.M.E. School on Friday, January 13, 2017. 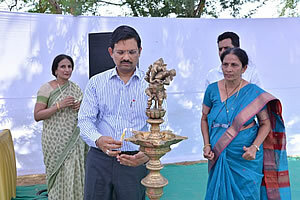 Mr. Arun Kumar, Basin Manager, Oil & Natural Gas Corporation Ltd., Vadodara was the Chief Guest. 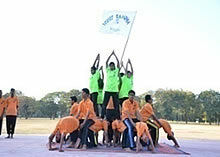 Students performed Aerobics made Pyramids, did various Drills and displayed Karate. After the track events, Nehru House won the House Trophy. The programme ended with the National Anthem in Sign Language. 35 students went to Kamatibaug and Laxmi Vilas Palace, Vadodara. Organized by FAG Bearing India Ltd., Vadodara, 24-01-2017. 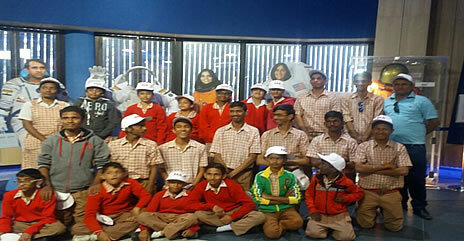 55 students went to ISRO and Sundervan in Kakaria Zoo, Ahmedabad. Organized by FAG Bearing India Ltd., Vadodara, 17-01-2017 & 19-01-2017. The Teacher Training Programme entered its 17th year in 2016. Till date 253 teachers have been trained and 12 are completing their course. 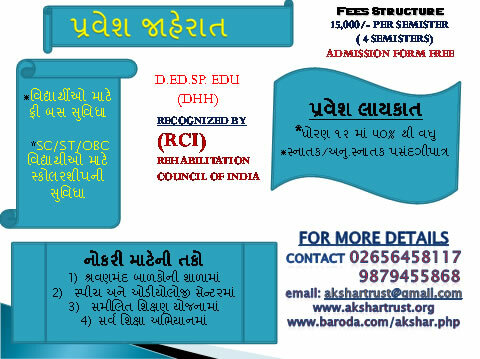 Akshar is affiliated with Baba Saheb Ambedkar Open University for a 2 Year Distance Mode B.Ed. (SEDE) programme. 37 students have cleared the course and 20 are pursuing the course. Akshar Trust has conducted a 5-Day CRE Workshop on ‘Educational Assessment and Evaluation’, Sept. 19 to 23, 2016. 50 educators from different Special areas of Specialization (HI, MR, VI) and Psychologists from Special Schools and Sarva Shikshan Abhiyan attended. Ms. N. Grover, Ms. H. Kale, Ms. G. Parmar, Mr. P. Desai. 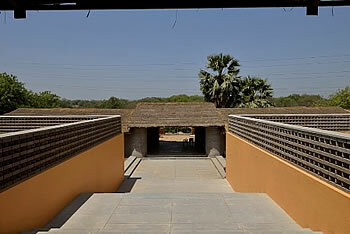 Mr. K. Thakkar, Ms. F. Shah, Ms. R. Haldankar and Ms. N. Rynththiang were the faculty. Ms. Geeta Parmar interpreted for 5 deaf girls/women, found at different places at Nari Suraksha Gruh on November 26, 2016. The homes of 2 girls were found. NCED-Gujarat Chapter and Akshar Trust, Vadodara organized the 6th Annual Conference from Dec. 14 to 16, 2016 at Hotel Surya Place, Vadodara. 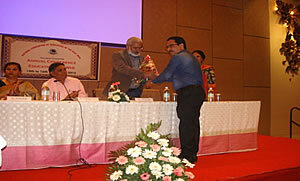 ‘Modern Practices and New Horizons in Education of Children with Hearing Impairment’ was the theme. 236 participants and 35 papers were presented. 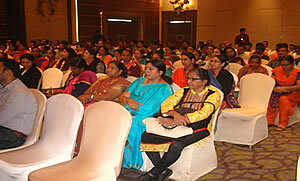 All the teachers of Akshar and the teacher training faculty were present. Mr. A. M. Tiwari, IAS, Managing Director, GSFC, Vadodara was the Chief Guest at the Inaugural Function and Mr. Rajendra Trivedi, Honourable Minister of Sports, Youth and Culture was the Chief Guest at the Valedictory . The students of Akshar presented ‘Karate Skills’ at the Inauguration. The National Anthem in Indian Sign Language concluded the conference. Ms. V. Patel was received the 2nd prize for her Paper and Mr. Om. Parkash received the 3rd prize.